Thank you to Joseph, John, Tina, Justin, and Bob for coming out to the Public Market on a very cold windy day today to show passers-by the truth about where their food comes from. I held a TV and watched as a woman was horrified to learn what the egg industry does to chicks and chickens on behalf of those who buy eggs. Thanks to Joseph for organizing and hauling the equipment, and to Darren for lending us your speaker. There is another Cube of Truth next Saturday. 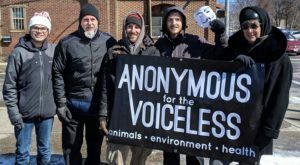 Anonymous for the Voiceless‘ Cube of Truth is a peaceful static demonstration akin to an art performance. 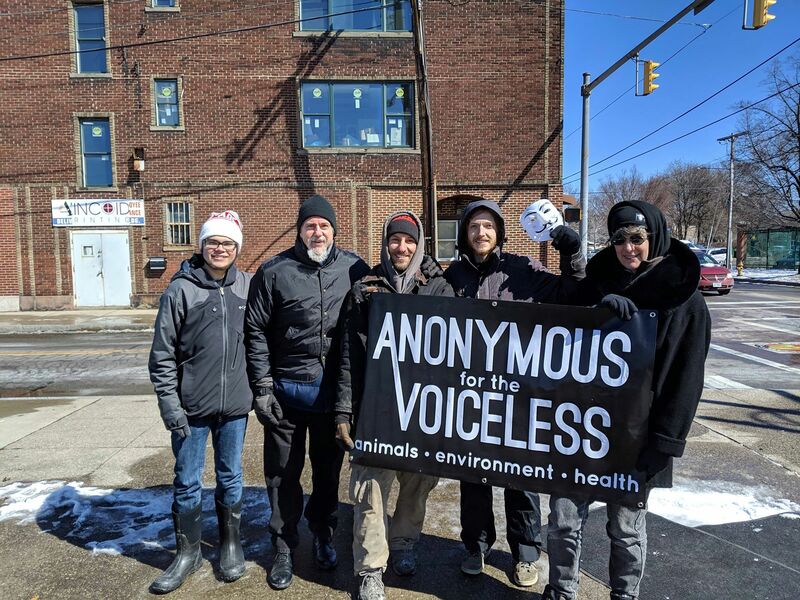 This demonstration operates in a structured manner that triggers curiosity and interest from the public; we attempt to lead bystanders to a vegan conclusion through a combination of local standard-practice animal exploitation footage and conversations with a value-based sales approach. Newcomers are warmly welcomed. No experience is necessary. Masks, signs, and outreach literature are provided. Black upper clothing appropriate for the weather is essential. If you are interested in volunteering, please join the AV Rochester NY Facebook group. Nearby cities with AV groups: Syracuse, Buffalo and Ithaca.